The advantages and disadvantages of dietary fat intake are a controversial subject. Beliefs and theories around its optimal quantity and quality are ever changing. Saturated fatty acids (SFA) have been in the line of fire for more than three decades. The major mistake in studying the effects of fats was to equate all SFA as one. The oversimplification of the relationship of saturated fats with cardiovascular disease (CVD) led to unwarranted restriction and removal of some valuable fats from our diets. This article highlights the distinction between good and bad SFA. SFAs are in solid state at room temperature. The main sources include butter, ghee, lard, tallow coconut, palm, and palm kernel oil. SFAs are also called nonessential fats (not to be confused as unimportant). This is because it is considered that the body does not require SFA to be provided through diet as it can make them by itself when needed, unlike essential fatty acids found predominantly in vegetable oils, which need to be taken through diet. Furthermore, with reports of their association with an increased risk of CVD, they have largely been replaced by refined vegetable oils and hydrogenated fats (vanaspatis and hydrogenated margarines). Historically, the so-called “lipid hypothesis” has been primarily focused on the detrimental role of SFA in enhancing the risk of CVD. According to the classic “diet-heart” hypothesis, high intake of SFA and cholesterol and low intake of polyunsaturated fats acid (PUFA) increase serum cholesterol levels, which leads to the development of atherosclerosis. However, not all SFA have similar effects on serum low-density lipoprotein cholesterol (LDL-C). Butter and other dairy fats (high in myristic acid) most strongly increase LDL, beef fat (containing palmitic and stearic acid) raised LDL to a lesser degree and cocoa butter (largely stearic acid) raises LDL only modestly. Medium-chain saturated fats, such as those found in coconut fat, appear to be more atherogenic in animals than predicted solely on the basis of their relationship with serum cholesterol, but they potently increase high-density lipoprotein cholesterol (HDL-C). Recently, the relationship of dietary SFA and that of individual SFA to CVD risk has been reevaluated. All SFA are not equal and these fats are not as bad as they are made out to be. So far believed to increase the risk of heart disease, recent research suggests a protective role of SFA toward health and heart disease. A recent meta-analysis that included 16 cohort studies showed no association between SFA intake and ischemic heart disease risk. Further three meta-analyses, including the study results of a total 22 observational cohorts, found no association between SFA intake and CVD incidence.,, A recent cohort study published in American Journal of Clinical Nutrition among 35,597 Dutch men and women reported that a higher intake of total SFAs was associated with a lower risk of CVD. Ancel Keys is largely responsible for starting the “anti-saturated fat” agenda. From 1953 to 1957, Keys made a series of statements regarding the atherogenicity (artery clogging ability) of saturated fats. This “anti-saturated fat” issue became the agenda of the government and private agencies in the US and to an extent in other parts of the world. This has had such a devastating effect on the traditional fat industry for the past three decades. However, the experiments he did were using saturated fats laden with trans-fatty acids (TFAs) that had been artificially created from vegetable oils using a process called hydrogenation. There are several traditional sources of saturated fats and oils, which have lost their glory. Desi ghee: The fears of cholesterol and saturated fat have virtually driven out the most revered cooking ingredients in the Indian kitchen-grandma's desi ghee. The negative impression of desi ghee is because of an exaggerated fear of its cholesterol and saturated fat content, thanks to the saturated fat and cholesterol hypothesis of Professor Ancel Key. This suited vegetable oil manufacturers who were quick to take advantage of these findings. A closer look reveals that such a negative view about this highly nourishing food does not stand the test of scientific logic. Since ghee is derived from milk, it is essentially an animal product. Therefore, it contains a certain amount of natural saturated fat (65%) and cholesterol. Of the unsaturated 35%, the cheif one is oleic acid, a MUFA which reduces LDL like PUFA. MUFA is better than PUFA as they do not lower HDL and may infact raise it. A desirable feature of desi ghee is that it has an ideal linoleic/alpha linoleic acid (LA/ALA) ratio. This ratio is unusually high in most PUFA oils, which is undesirable. It is now recognized that the consumption of oils with ideal LA/ALA ratio is crucial for prevention of coronary heart disease (CHD) and perhaps diabetes also. It will also not be out of context to mention here that an excess PUFA rich oils may depress HDL-C level, thereby, increasing the risk of CHD. Further, desi ghee is not prepared by heating to very high temperatures, such as refined oils. This preserves its original nutritional properties, which are lost during refining oils. Ghee is also rich in Vitamins A, D and riboflavin as well as minerals such as calcium, magnesium, phosphorus, and potassium. Butter too is predominantly a combination of lipid neutral butryic acid and stearic acid. The percentage of lauric acid and myristic acid which are atherogenic is low. It is also a rich source of vitamins such as desi ghee [Table 2]. Palm oil: What makes palm oil so special and versatile is its balanced fatty acid composition (50% saturated and 50% unsaturated). Palm oil contains significant amount of carotenoids, along with tocopherols and tocotrienols, phytosterols, and glycolipids. Owing to these properties, palm oil has been reported to protect against cardiovascular ailments, cancer, and aging. Phytosterols, “fat-like” substances also help in lowering blood cholesterol levels and have also been found to protect against cancer. According to studies, palm oil increases HDL-C without raising the overall cholesterol levels. It is also effective at reducing the levels of LDL-C.
Palm oil can be used for traditional Indian cooking as it is fairly heat stable compared to other oils. Considering it has no TFA, use of palm oil in India appears favorable when supplemented with omega 3 rich oils [Table 2]. Coconut (copra) oil: It is characterized by high SFA content, particularly short-chain lauric acid, and low levels of unsaturated fatty acids. All fatty acids in SFA do not have cholesterol-raising potential. Moreover, studies done on coconut oil with respect to its cholesterol raising causing potential were done on “hydrogenated” coconut oil. In fact, studies done later on coconut oil which was not hydrogenated  and fed physiologically with other fats or adequately supplemented with linoleic acid – an essential fat, found coconut oil is a neutral source of fat in terms of atherogenicity. Epidemiological and experimental data regarding coconut-eating groups note that dietary coconut oil neither leads to high serum cholesterol nor to increase coronary artery disease, –mortality or morbidity. In fact, some studies have shown that when coconut oil is added to otherwise normal diets, there is either no change or a decrease in total cholesterol and LDL. A study conducted at University of Kerala by Nevin and Rajamohan et al. in 2004 demonstrated the potential beneficial effect of virgin coconut oil in lowering lipid levels in serum and tissues, and LDL oxidation by physiological oxidants – polyphenols present in the oil. Coconut oil has a fairly good “thermogenic effect,” thus beneficial for obesity management. Virgin coconut oil, which is produced locally using traditional, low-technology process, is desirable. Most commercial coconut oil is refined, bleached, and deodorized at temperatures over 200 F or treated with solvents and subjected to even higher temperatures. Refining and bleaching deplete Vitamin E and other nutrients. However, virgin coconut oil is extracted at lower temperature (up to 170 F) preserving most of its nutrition. The Nurses' Health Study of 85,095 women without diagnosed CHD, stroke, diabetes, or hypercholesterolemia at the start of the study reported that the intake of TFAs was related to the increased risk of CHD after 8 years of follow-up. Natural SFA was only weakly and non-significantly associated with risk of heart disease. Clearly, the villain is industry produced trans-fat rather than natural SFA. In fact, TFAs also occur naturally in animal products or they are industrially produced by passing hydrogen gas through liquid vegetable oils. Naturally occurring TFAs include conjugated linolenic acid (CLA), found in dairy and dairy products including butter and cheese. CLA is believed to be protective against heart disease, obesity, and cancer. Intake of 1% CLA in diet has been reported to reduce the breast cancer incidence by nearly 60%. Researchers have also discovered in animal experiments that CLA helps in lowering total cholesterol, VLDL-C, LDL, LDL-HDL ratio, total cholesterol-HDL ratio, and triglycerides and reduced arterial plaque build-up. CLA also prevents heart diseases by exhibiting antioxidant activity and inhibiting formation of free radicals. Furthermore, researchers suggest that CLA has a tocopherol (Vitamin E) sparing effect. Vitamin E is a powerful antioxidant. Additional potential benefits include a reduction in food-induced allergic reactions as well as the overall enhancement of the immune system. Vaccenic acid, another naturally occurring trans-fat found in meats and meat products (beef [2%–5%] and lamb [8%]) and eggs (trace levels depending on feed). Naturally occurring TFAs do not contribute to ill health. There is growing evidence that SFAs in the context of dairy foods, particularly fermented dairy products, have neutral or inverse associations with CVD. The industrially produced TFAs include Elaidic acid. These are by-products of partial hydrogenation – a process that turns liquid fats into solid fats at room temperature by heating under pressure in the presence of metal catalysts nickel and hydrogen. They increase shelf life and melting point, making them cheap alternatives to animal fat such as butter and ghee. TFAs are found in vanaspatis, hydrogenated margarines, and bread spreads and even in small amounts in refined vegetable oils. Saturated fats found in industrially produced TFAs have atherogenic properties and have detrimental effects on our health. Scientific studies report that dietary TFAs are associated with increased risk of CVD. Total TFA content in diet should not be more than 1% of the total calories. A 1% increase in TFA intake reduces HDL by 1% and increases LDL by 1%. It has also been reported that an intake of 2–3 g of TFAs increase the risk of CHD by 21% and an intake of more than 5 g increases the risk by 25%. TFAs also worsen insulin resistance, endothelial dysfunction, and increase low-grade inflammation of blood vessels, which may cause atherosclerosis [Table 1]. The Dietary Guidelines Advisory Committee also retained the upper limit for SFA intake of 10% of energy, in contrast to the recently proposed limit of 5%–6% of energy in the American Heart Association/American College of Cardiology Dietary Guidelines, in part reflecting concern that more extreme SFA restriction may be accompanied by increased consumption of carbohydrates. The main premises for limiting dietary SFAs are (a) the prediction of a progressive reduction in CVD risk associated with greater reductions in LDL-C and (b) evidence for benefits on CVD risk of dietary patterns that include low SFA intake, i.e., dietary approaches to stop hypertension and Mediterranean diets. The major food sources of SFAs are dairy products and red meat, as well as tropical oils, such as palm and coconut oil. Recent evidence suggests that SFA effects on lipids and lipoproteins are modulated by the food source within which they are consumed. It is clinically relevant to distinguish between sources of saturated fats for cardiovascular health. Medium, and possibly shorter chain, saturated fats behave differently than long-chain saturated fats and should not be judged similarly when it comes to their cardiometabolic health effects. Given their neutral and potentially beneficial cardiovascular health effects, they should not be categorized together. Observational studies suggest that consumption of dairy products is associated with improvements in cardiometabolic factors that may impact CVD risk. Several studies have also shown that full-fat cheese results in lower total cholesterol, LDL-C, and/or LDL-C- HDL-C ratio even after consideration of differences in SFA content. Palm oil has become a popular substitute for partially hydrogenated vegetable oils due to its semisolid nature and stability compared to other vegetable oils. Thus, not all SFAs in natural fats are atherogenic. 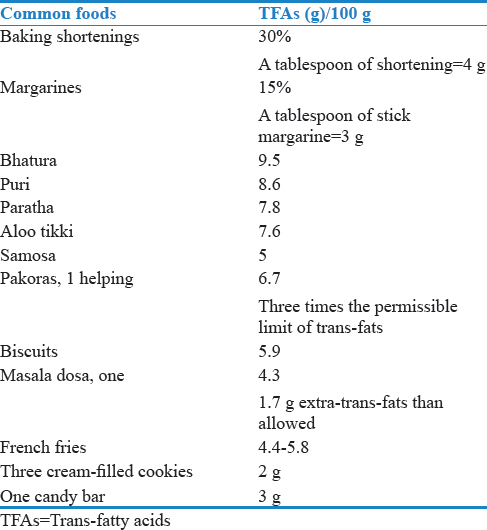 Butter, clarified butter (desi ghee), coconut oil, and palm oil as a part of a healthy diet are not contraindicated. The review of literature clearly suggests a relook at saturated fats with respect to atherogenicity and over health. There is a case for recommending a variety of fatty acids rather than only one or two. There is also a clear case for reduction or removal of harmful saturated fats such as hydrogenated fats from the food supply toward prevention of CVD and maintenance of good health. Drawing conclusions on a few research findings in the West and applying them in larger contexts in India is not valid. Indians have unique risk factors for developing coronary artery disease, quite distinct from the Western World. It is important to analyze these to conduct our own research to formulate special guidelines for Indians, rather than simply applying Western guidelines. While concerns about oils and fats are justified both with respect to their amounts and types, simplistic conclusions drawn on research hypothesis can be hasty and even dangerous. More so, in the traditional Indian texts including Ayurveda, traditional fats, and oils including desi ghee and coconut oil have been prized for their health promoting and healing properties. Furthermore, as was the traditional practice, no one cooking medium is ideal: a combination is the best. A blend of cold pressed coconut, sesame, and mustard oil along with desi ghee and butter is desirable. It may be more useful to avoid potato chips, hamburgers, pizzas, French fries, samosas, namkeens, and other commercial foods prepared in vanaspatis or hydrogenated margarines such as patties, biscuits, cookies rather than curtailing our traditional fats, and cold pressed oils. Current research clearly suggests that the real villain in our diets is trans-fatty acids coming from hydrogenated vegetable oils and hydrogenated margarine and not foods with natural saturated fat. Willett WC. Dietary fats and coronary heart disease. J Intern Med 2012;272:13-24. Bier DM. Saturated fats and cardiovascular disease: Interpretations not as simple as they once were. Crit Rev Food Sci Nutr 2016;56:1943-6. Praagman J, Beulens JW, Alssema M, Zock PL, Wanders AJ, Sluijs I, et al. The association between dietary saturated fatty acids and ischemic heart disease depends on the type and source of fatty acid in the European Prospective Investigation into Cancer and Nutrition-Netherlands cohort. Am J Clin Nutr 2016;103:356-65. Mead, JF, Alfin-Slater RB, Howton DR, Popják G. Lipids: Chemistry, Biochemistry and Nutrition. New York: Plenum Press; 1986. Blackburn GL, Kater G, Mascioli EA, Kowalchuk M, Babayan VK, kBistrian BR. A reevaluation of coconut oil's effect on serum cholesterol and atherogenesis. The Journal of the Philippine Medical Association 1989;65:144-152. Nevin KG, Rajamohan T. Beneficial effects of virgin coconut oil on lipid parameters and in vitro LDL oxidation. Clin Biochem 2004;37:830-5. Willett WC, Stampfer MJ, Manson JE, Colditz GA, Speizer FE, Rosner BA, et al. Intake of trans fatty acids and risk of coronary heart disease among women. Lancet 1993;341:581-5.
WHO, Food and Agriculture Organization of the United Nations. Diet, Nutrition and the Prevention of Chronic Diseases. Report of a Joint WHO/FAO Expert Consultation. WHO Technical Report Series, No. 916. Geneva: WHO; 2002.